David Hansen certainly gives his all on this intimate and hopelessly romantic album; every track was written, produced, and arranged by himself. 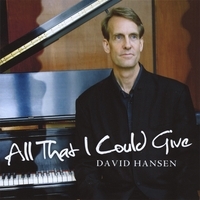 Hansen juggles several styles here – contemporary classical, jazz, New Age, Adult Contemporary, and world music – and manages to stitch them together in the context of moving ballads and spunky instrumentals. Snappy drums and upbeat keyboards produce a playful groove for the opening piece, “Armada.” The synthesized rhythms have a somewhat ’80s flavor that might remind you of fusion efforts from that era. On the title track, we can hear Hansen’s voice for the first time; it is soulful and deep, not too different from Peter Gabriel’s. A tale of lost love, Hansen’s melancholy lyrics blend well with Joel Hips’ smooth-jazz riffs, increasing the pensive emotions of the piece. “Love in Three Days” thematically seems to be a continuation of it with Bob Mathis’ tropical flute adding an island flavor to the song. There has to be a personal heartache behind these compositions. Throughout the record Hansen balances the experimental tendencies of New Age with the fine craftsmanship of contemporary classical and the unguarded feelings of pop; whether he’s expressing himself wordlessly or through the warm glow of his singing, Hansen has us in the palm of his hands.